Trying to make an informed decision about how much your business needs to invest in technology, apps, or social media? There is one place to start all your research efforts: The Pew Research Center's Internet & American Life Project. The project is one of seven that make up the Pew Research Center, a nonprofit "fact tank" that provides information on the issues, attitudes and trends shaping America and the world. 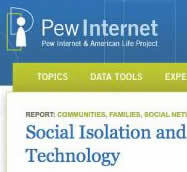 The Project produces reports exploring the impact of the Internet on families, communities, daily life, and health care. Half of adult cell phone owners have apps on their phones. Key finding: The share of adult cell phone owners who have downloaded an app to their phone nearly doubled in the past two years – rising from 22% in September 2009 to 38% in August 2011. Teens, kindness and cruelty on social network sites. Key finding: 95% of all teens ages 12-17 are now online and 80% of those online teens are users of social media sites. The Social Life of Health Information, 2011. Key finding: The internet has changed people’s relationships with information. Online resources, including advice from peers, are a significant source of health information in the U.S.